This was first featured on Space Wolves Blog in 2009 which is now lost to the warp. In an effort to retain the information we have republished it here. The points will not be correct with the correct codex. Wolf Guard not only act as bodyguards for Wolf Lords, but also as leaders for Space Wolves packs. Each Wolf Guard has the option to be assigned to a different pack from the Space Wolves army, making this Elite choice a very flexible option. However, you must take at least 3 Wolf Guard in your army as a minimum requirement and no more than 10 per Elite choice. Wolf Guard represent the personal bodyguard/retinue of your Wolf Lord, so typically, there won’t be many of them -especially when the Space Wolves force chart represents troops drawn from a single Great Company. So we’re going to look at Wolf Guard; both as squad leaders and a unit themselves. The first thing you’ll notice about Wolf Guard is that their equipment is cheaper than everyone elses! Wolf Guard are the heroes of your Space Wolves Great Company, so it’s only fitting that they get the best weapons and armour. This also makes them very affordable as squad leaders for your Space Wolf packs, but more on this later. Power Weapon – Very affordable option. Wolf Claw – Also very affordable at only 5pts more for rerolls. Powerfist or Frostblade – Both cheap, both excellent! Thunder Hammer – a nice upgrade to a powerfist, but not essential. Chainfist – definitely better than a powerfist and a thunder hammer for killing vehicles. Terminator Armour – 33pt terminators with storm bolter and power weapon? Yes please! Jump Pack – Wolf Guard cannot join Skyclaw packs, so what’s the point? Also expensive. Melta Bombs – take them if leading a squad! 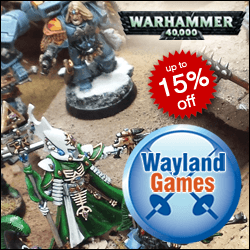 Mark of the Wulfen – The discounted Wolf Claw is more cost effective. Heavy Flamer – cheap and very cheerful. Short ranged. Assault Cannon – You love it! And it’s more affordable. Cyclone Missile Launcher – 2 frag or krak missiles per turn. Also more affordable. If you’re going to field actual squads of Wolf Guard in your army, you’ll want them in Terminator Armour. Otherwise you’re pouring your points into an elite unit that dies just as easily as regular Space Marines. The best way to equip these squads would be in a similar way to Chaos Space Marine Terminators who often come with power weapons, combi-weapons a single chainfist and often a heavy weapon too. Chaos Space Marine Terminators come with a twin linked bolter, a power weapon and Leadership 10 for 30pts. Wolf Guard in Terminator Armour armed with a storm bolter, power weapon, They Shall Know No fear, Acute Senses and the Counter Attack special rules come to 33pts each. That’s a lot of extra stuff for just 3pts! 2 Wolf Guard in terminator armour with combi-plasma and power sword. 1 Wolf Guard in terminator armour with combi-melta and power sword. 1 Wolf Guard in terminator armour with combi-melta and Chainfist. 1 Wolf Guard in terminator armour with heavy flamer and power sword. This squad is reasonably cost effective with a focus on anti-armour and anti-tank as well as a heavy flamer for hordes of light infantry. Great to deploy by Drop Pod or from a Land Raider. The squad costs only 15pts more than a comparable Chaos Terminator squad, but their Counter-Charge special rules give them a distinct advantage should anyone be mad enough to attack them in close combat. For an extra 5pts, you can give one of them a wolf claw to really max-out your Wound Allocation. When it comes to leading your Space Wolf packs, Wolf Guard are a surprisingly affordable squad leader upgrade. 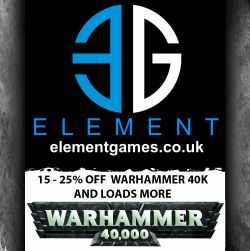 Remember that their weapons are generally 5pts cheaper and when they themselves cost only 3pts more than a regular Grey Hunter, 3pts is a small price to pay for an extra attack and an extra point of Leadership. The increase in Leadership is almost essential for any Space Wolves pack that will come to rely on the Counter-Charge special rule at some point in a game. So really, Wolf Guard can be a very cost effective way to achieve a number of otherwise expensive squad upgrades while getting the benefits of another model type for wound allocation, an extra attack and an increase in Leadership. Generally, every squad should have 1 powerfist. So why not save 5pts by giving it to your Wolf Guard? On top of that, you get an extra attack with it because each Wolf Guard has 2 attacks on his profile instead of 1. You also need to buy a combi-weapon if your Space Wolves pack are riding in a transport to make up for the free one you normally get for having 10 men in a squad. Providing you want a 10-man squad of course. Compared to a Grey Hunter armed with a ‘free’ melta gun and a powerfist at 40pts, 3pts more (5pts for melta bombs) is a small price to pay for a Wolf Guard with and extra attack in his profile and increased Leadership that benefits the entire squad. For 5pts more, you can upgrade your Wolf Guard to have a suit of terminator armour for better protection and a Chainfist for better anti-tank assault. Ironically you can have a combi-melta, powerfist and terminator armour for 48pts, but the Wolfguard then takes up 2 slots in a transport and the squad he’s with cannot making a Sweeping Advance. Even so, it’s a very close tie between having a Wolf Guard in power armour or a Wolf Guard in terminator armour. Definitely something to play test. Building on the great value for points combination already shown for leading Space Wolf squads on foot, but now with a bike. This guy is perfect for leading packs of Swiftclaw Bikers. He’s got a Powefist with more attacks and better Weapon Skill than a Blood Claw equivalent and his Combi-Melta is more likely to hit as well. He’s not cheap compared to the Swiftclaw Bikers, but he’s a more cost effective leader for them (so they don’t end up chasing something they can’t hurt for the whole game!) than any of the HQ choices. 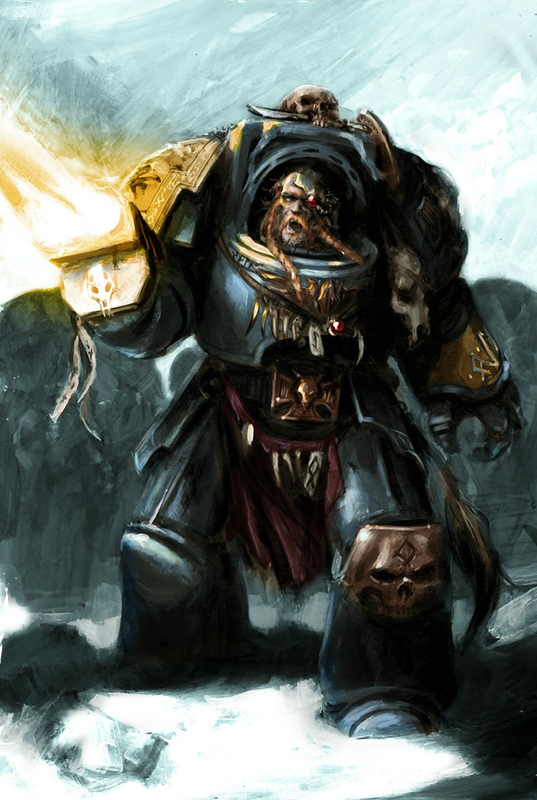 For every 5 Wolf Guard in your army, 1 may take a Terminator heavy weapon if they are in Terminator Armour. Attaching one of these to your regular Space Wolves packs is a fantastic opportunity. Not only do you get a tough guy in terminator armour leading a squad, but he’s got a massive gun as well. Terminator heavy weapons often come down to personal preference, but I can see lots of people taking the Assault Cannon, especially when the belt-feed model looks fantastically brutal! Personally, I’m in favour of the Cyclone Missile Launcher, because you get to keep your storm bolter while being able to fire either 2 frag or Krak missiles per turn, making it an all-round more versatile weapon combination for both tanks and troops. It has longer range as well. Like the earlier Terminator Wolf Guard examples, I’d always give him a Chainfist for clobbering monstrous creatures, ripping apart walkers and cutting through tanks in close combat. Due to their fantastic value for points and cheaper weapon upgrades, I would always take a Wolf Guard to lead my Space Wolves squads. You just get so much more for your points, even if you’re stepping on the ‘free’ special weapon available to a full size Grey Hunter squad. Wolf Guard are very much a big part of the Space Wolves army character. They’re not Space Marine Veteran Sergeants like their stats indicate, they’re heroes who have earned their place in the bodyguard of their Wolf Lord! They lead Space Wolves squads by example and their great deeds, which is made all the easier by their cheaper equipment. Most importantly, they get powerfists cheap and have extra attacks to make the most of them! Wolf Guard are also cheap terminators, having more in common with Chaos Space Marine Terminators than the regular Space Marine Terminators. So while they miss out on the Thunder Hammer and Storm Shield combo at 40pts (63pts for them), they have access to an abundance of power weapons, wolf claws and combi-weapons. This means they can wipe out an armoured infantry squad or monstrous creature far more quickly than regular Space Marine Terminators. But whether your Space Wolf packs will be led by a Wolf Guard in terminator armour or a Wolf Guard in power armour is up to you. Both have their own pros and cons.